Financial services companies face tremendous challenges related to information processing and financial reporting. Some of these challenges are caused by massive increases in both the amount of data and the complexity of financial systems that have occurred in recent years. Others are related to expanded regulatory demands for data transparency and compliance with specific reporting and audit requirements like International Financial Reporting Standards and GAAP. At the same time, the business demands that timely and accurate information be produced in a cost-effective manner, in ways that bestow a competitive advantage, and with the flexibility to respond quickly to changes within the business itself (such as through mergers and acquisitions) and in the larger context of the rapidly changing global economy. In many organizations the processes for acquiring, maintaining, and accessing information have failed to keep pace with the demands of higher volumes and finer detail. Furthermore, many companies have failed to take advantage of computing capacity that has increased by orders of magnitude since their original, limited finance systems were designed. To be competitive, companies must exploit the power of today’s computer systems to decrease IT system fragmentation, address scalability challenges, and decrease reporting pressures in order to provide timely underlying financial details as well as summary data. A number of commonly used business intelligence (BI) solutions have attempted to alleviate these reporting and processing challenges, but fail to adequately address all the issues. These applications have inherent limitations that range from their effect on system performance, to lack of timeliness and detail of data, slow speed of producing reports, and the inability to access data over dispersed, disparate systems. In contrast to these typical BI applications, IBM® Scalable Architecture for Financial Reporting (SAFR) provides a nearly ideal financial reporting environment. SAFR is much more than a reporting tool, though. It is an architecture and an approach that provides a complete programming environment, compatible with your existing systems, that solves data processing challenges across a variety of industries. SAFR enables quick and efficient processing, while scaling to deal with almost unimaginably large volumes of detail data, by leveraging the industry-leading capabilities of IBM System z®. The SAFR Financial Management Solution (FMS), built on the SAFR platform, was developed over a decade of work with some of the world’s largest financial services organizations. It provides accurate, consistent, transparent, and timely data at any desired level of detail. FMS can produce multiple outputs, such as data cubes, reports, and data marts. Processing rules are under the control of finance rather than embedded in programs in source systems, and an intuitive user interface enables finance personnel to manage and control their own accounting rules and reports, and reduces the complexity of looking at the data. Reducing the amount of time spent on the low value mechanical activities of assembling numbers enables finance practitioners to shift their focus to more productive activities, like analyzing the data and making business decisions. 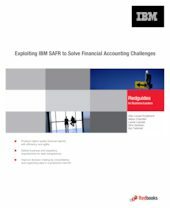 This IBM Redguide™ publication describes the SAFR solution and FMS, and demonstrates how these IBM offerings can help businesses solve their data processing challenges and meet their financial reporting needs.